As you drive into Malvern from the historic Lincoln Highway route from New York to San Francisco, one of the first sights is the water tower on your left which clearly indicates that you are heading in the right direction! A short distance on you cross the brow of the hill and drop down into a charming Main Street, with shops, a library and much more. This is clearly a township that has brought itself into the 21st century whilst still retaining the heritage style of much of the built environment. One this was a railroad town. 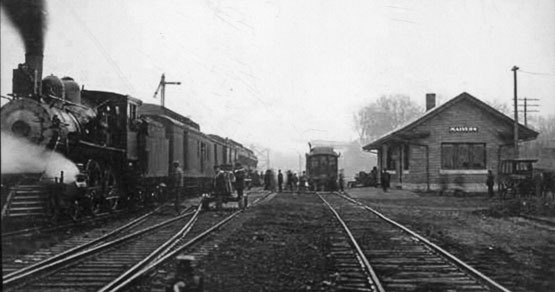 Completed in 1869, the Burlington and Missouri River Railroad made the location accessible. John Paddock and his family arrived that year and built a combined home and Malvern's first store. In flooded the future population and established not only homes but also business enterprises. After only 5 years the population numbered 800. Farming was the key industry and such enterprises as a hog packing plant flourished. A school was established the year after the railroad arrived and the infrastructure of a prosperous community soon followed. In the picture left can be seen illustrations of 'old Malvern' on this heritage plate. These include the old water tower, the railway, the church and a wind pump. 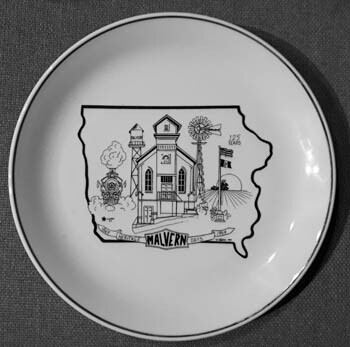 The plate is one of a number of items presented to Great Malvern UK by the township of Malvern Iowa. 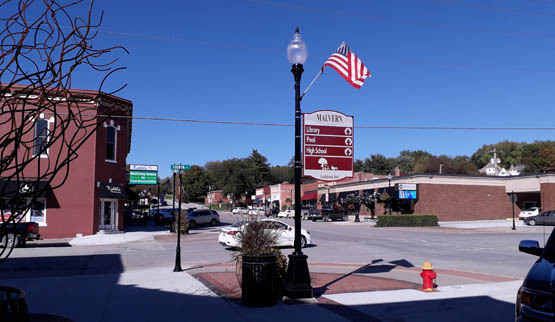 The location was initially named Milton but there was already a town so named in Iowa. The name was therefore changed to avoid confusion. Calling the town Malvern was at the instigation of a Dr S T Brothers in honour of his hometown Malvern in Ohio. 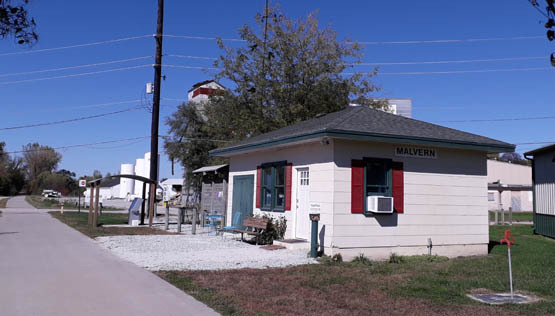 His hometown to the east was one of the four Malverns located just off the historic trail west, now known as the Lincoln Highway; Malvern Pennsylvania, Malvern Illinois and this Malvern in Iowa being the others. Prosperity followed this renaming in the 1870s coinciding with the enclosure of the free range landscape with barbed wire. In the mid 20th century the railroad closed and transport was by the much improved highways which by-passed Malvern. This caused economic stress at the time and key businesses moved away. This left Malvern with a doubtful 'raison d'etre'. Today we see a reinvented Malvern with modern infrastructure interspersed with reminders of its heritage. One of the churches in now an Arts Centre. The railroad is now a cycle track. The Library in the centre of town is the envy of many and the Historical Society reminds citizens of their forefathers endeavours. There is a National Airport a short distance away making the world accessible and the township contains just about all the facilities that one could want to support a community of well over a thousand. Malvern is clearly a town with a vision of the future. 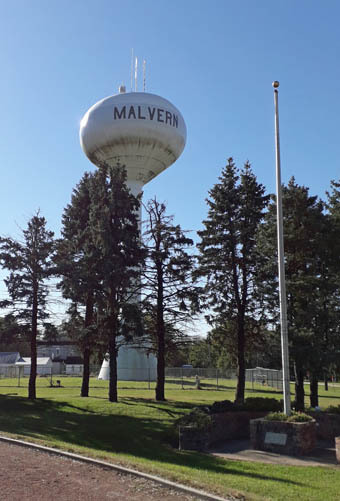 In 2018 we were delighted to welcome Malvern Iowa into Malverns Worldwide. Following a visit by Cora and Bruce, gifts of our respective Malverns were exchanged and these will be reminders of our welcome and friendship. 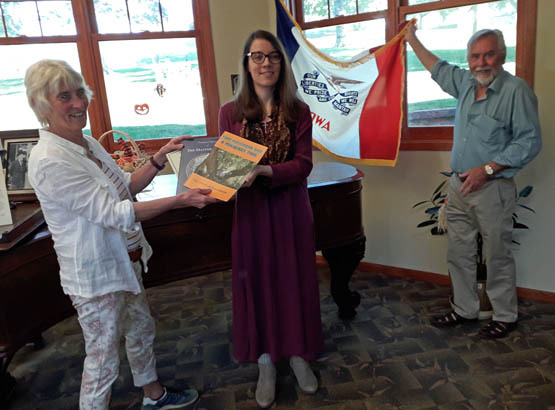 In the picture Malverns Worldwide local honorary International Ambassador Rebecca Bassich receives gifts from Great Malvern UK presented by Cora while Bruce holds up the Iowa State flag.